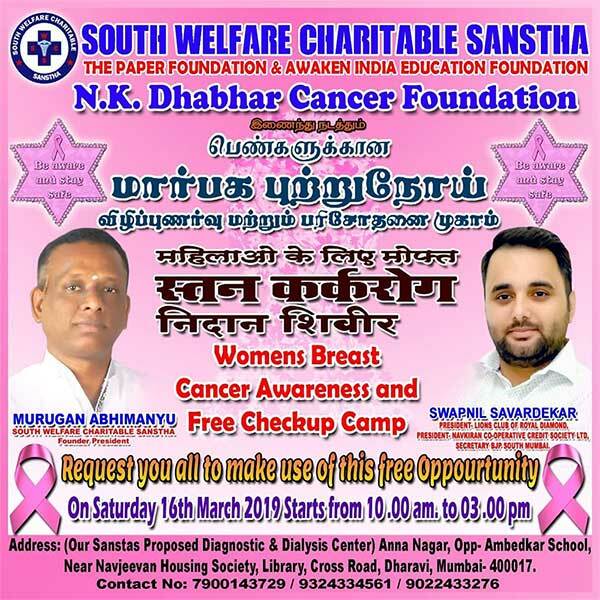 Free Breast Cancer Check up & Awareness camp for our womens on Saturday (16.03.2019) morning 10 am to 3 pm. Breast cancer has ranked number one cancer among Indian females with age adjusted rate as high as 25.8 per 100,000 women and mortality 12.7 per 100,000 women. Data reports from various latest national cancer registries were compared for incidence, mortality rates. The age adjusted incidence rate of carcinoma of the breast was found as high as 41 per 100,000 women for Delhi, followed by Chennai (37.9), Bangalore (34.4) and Thiruvananthapuram District (33.7). A statistically significant increase in age adjusted rate over time (1982-2014) in all the PBCRs namely Bangalore (annual percentage change: 2.84%), Barshi (1.87%), Bhopal (2.00%), Chennai (2.44%), Delhi (1.44%) and Mumbai (1.42%) was observed. Mortality-to-incidence ratio was found to be as high as 66 in rural registries whereas as low as 8 in urban registries. Besides this young age has been found as a major risk factor for breast cancer in Indian women. Breast cancer projection for India during time periods 2020 suggests the number to go as high as 1797900. Better health awareness and availability of breast cancer screening programmes and treatment facilities would cause a favorable and positive clinical picture in the country.